Income tax authorities have turned the heat on taxpayers who have missed paying Advance Tax as the department makes a year-end dash to meet budget targets. The authorities have started issuing show-cause notices asking assessees to explain why any advance tax installment was missed. They are also demanding a copy of the accounts for the period until January 15, 2019, warning of stern action if the tax is not paid in time. “These notices were sent out when it was observed that a taxpayer has suppressed advance tax payment,” a senior government official told ET. However, he said only a few notices had been issued. “It is apparent that the assessee is not paying proper advance tax. In this regard, you are hereby asked to explain why an order under section 210 (3) should not be passed in your case,” according to a notice seen by ET. The notice also asks the taxpayer to submit the calculation of estimated tax liability for FY2019. With revenue collections from the goods and services tax expected to miss the target for the year, the government is looking at direct taxes to overcome some of the shortfalls. The government has said it will meet the fiscal deficit target of 3.3% of GDP for the year. Advance tax is paid in four installments – June, September, December, and March. It is based on the taxpayers’ assessment of projected income and provides an indication of the industry’s performance in the months ahead. Typically, 15% of the tax liability is paid in June, 45% by September, 75% by December and full payment by March. “Tax authorities are leaving no stone unturned to see that the targets for raising revenue are met. Assessees who have not paid advance tax is being closely monitored by the tax authorities,” said Rakesh Nangia, founder and managing partner of Nangia Advisors LLP. Nangia said with GST collections behind the target, there is an aggressive drive to see that other targets for FY19 are met. However, experts said such notices are usually used sparingly and taxpayers may have paid the lower tax due to working capital issues. 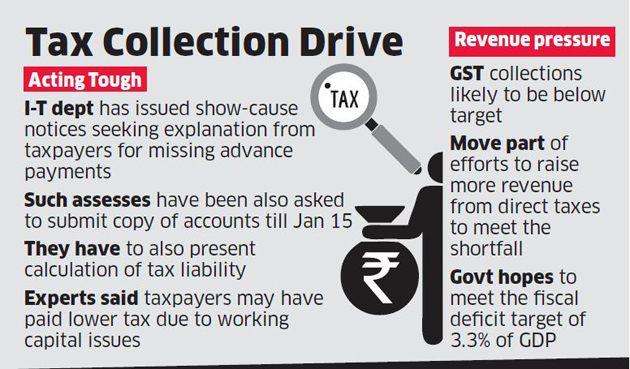 Net direct tax collections increased by 13.6% to Rs 7.43 lakh crore during April-December, equivalent to 64.7% of the budget estimates of `11.5 lakh crore, the government said earlier this month.